With the start of this new year, and the start of the new AMID group in sight, we will also come to the closure of the AMID 2018 year. 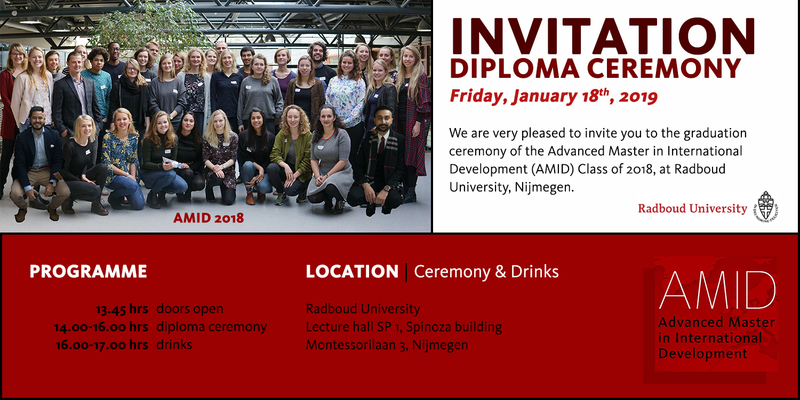 On Friday, 18th January 2019 at Radboud University, Nijmegen we celebrate the graduation of the AMID 2018 group. The graduation ceremony will take place in SP1 and start at 14.00 hrs. The Radboud campus can be easily reached by public transport. For parking instructions see here. Following this link, you can also find a map of the Radboud University campus.